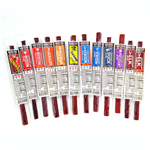 Twelve individually wrapped wild game meat sticks in a gift-ready package. This colossal assortment packs on the protein not the pounds. We use real hickory wood smoke not flavoring or any other artificial ingredients. Twelve unique meats from savory to spicy to a little sweet will satisfy your individual hankering. 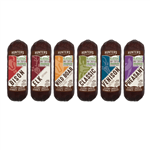 No Nitrites, Gluten Free, No MSG. No Fillers - Just Flavor! Succulent, tender and seasoned to perfection for the wild game enthusiast. Perfect for taking on the trail, to the deer stand or making your co-workers jealous!